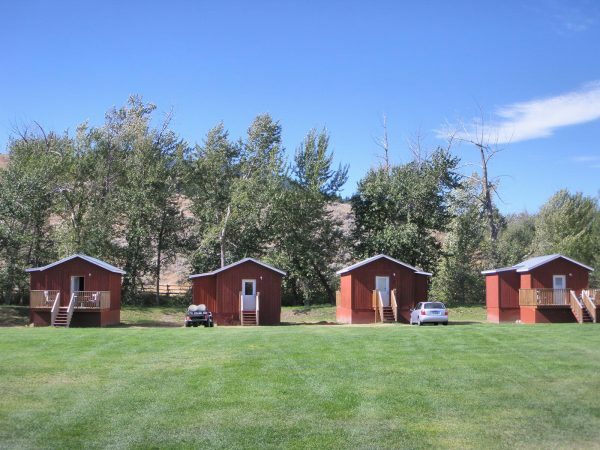 Choose a comfortable bunkhouse or family cabin, complete with a full bathroom and power. 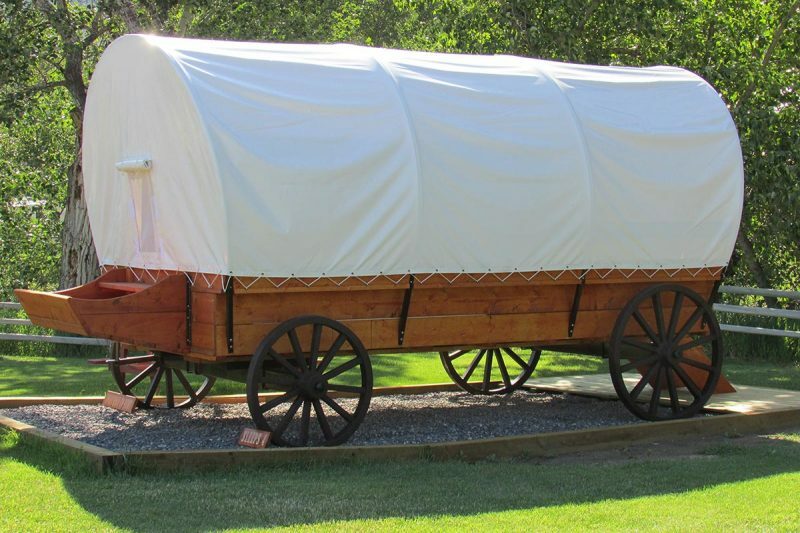 Experience a night in our unique covered wagon with 4 single bunks. Rent an RV site with or without power. Our two “bunkhouse” cabins (on each end) have air conditioning and contain 2 sets of bunk beds (4 singles) and a double futon in one large room plus a front deck. There is no separate bedroom in the bunkhouse cabin. Each cabin can sleep 5 or 6 people and comes complete with bedding and towels, a full bathroom with bathtub & shower, a deck with table & chairs, and a small fridge & coffee maker. There are no cooking facilities or utensils in the cabins. 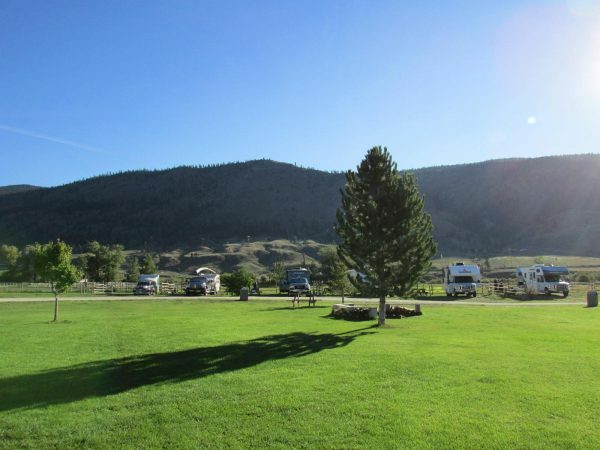 8 RV sites are equipped with standard 30 amp electricity. There are no water hook-ups or sani-dump on site. Please visit the giftshop to fill your water tank. 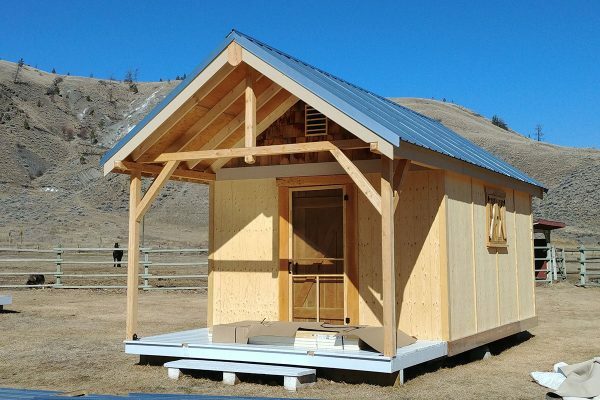 There is a sani-dump station at the Cache Creek Visitor’s Center – 10 minutes south of Hat Creek, between Subway and Hungry Herbie’s. 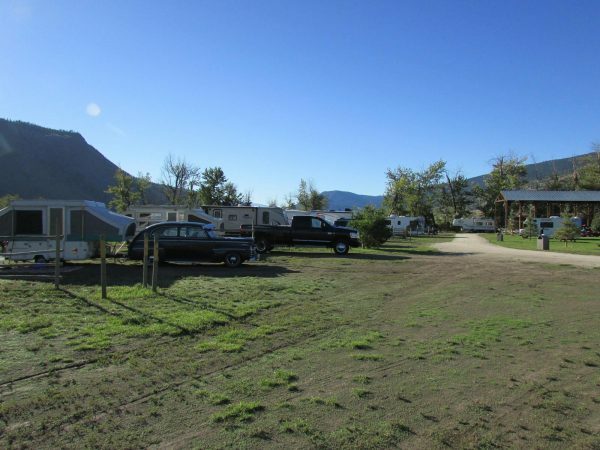 The RV sites are located near all amenities such as washrooms, showers, fire pits, and the Visitor Center with our licensed Roadhouse Restaurant and Gift Shop. Cost: $ 30.00 + GST per night/site with electrical hook-up. There is a large lawn area next to the powered sites and close to the washrooms, showers, fire pits and our Visitor Center/restaurant. This area is not supplied with electric hook-ups and is suitable for tent camping and non-powered camper and rv parking. Cost: $ 25.00 + GST per night / per tent or camper. Replacing the 4 miner’s tents, we have 4 new prospector shacks under construction. Each shack is approx 135 sq ft plus a 10′ x 6′ deck. They are empty inside. There is no power/water/furniture in these sheds. This is a budget friendly option where you bring your own mat and sleeping bag and pay only $45/night, no matter how many people you fit inside. Mats and bedding are available to rent from us, see costs below. They are located close to the washrooms, showers, fire pit, and the Restaurant /Gift Shop. 4 single bunks with bedding and towels included. There is an indoor sitting area and closet space for hanging clothes and storing luggage. There is no power or water inside the wagon. Space availability is limited, we recommend you make your reservations early! We require your Visa or M/C number and expiry date to hold your reservation. The credit card will NOT be charged in advance. A 48 hour cancellation policy is in effect.